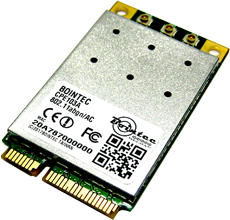 Bointec CPE103A is an 802.11abgn/AC compliant dual-band 3x3 Full mini PCIe Card. It is based on Qualcomm Atheros QCA9880 chipset, designed to deliver wireless data rates of up to 1.3Gbps. The CPE103A supports 20/40/80MHz and 256-QAM to maximize bandwidth efficiency. Each card is individually tested and inspected to ensure the industry’s highest quality resulting greater performance and reliability. CPE103A card gives customers the ability to easily and reliably support applications where this extra bandwidth and performance is required, like deploying HD video over Wi-Fi.Applications include commercial AP, routers, gateways, large-size printers, video devices, medical devices etc.